Alsace’s combination of multiple grape varieties, a climate ideally suited to viticulture and unusually complex geology enables this remarkably picturesque region to make world-class wines in just about every vintage. The wines of Alesia were highly regarded at least as early as the 7th century. It is noteworthy that even a thousand-plus years ago, there appears to have been a clear understanding of the importance of site and grape variety in Alsace. For example, the wines of the Mambourg and the Hengst were well known in the 8th and 9th centuries respectively; other grand crus such as the Zoztenberg and the Goldert have long been renowned for their high-quality wines from specific varieties (Sylvaner and Muscat, in these two instances). That sort of history goes a long way toward explaining today’s Alsatian wines. The region offers a larger number of vinous interpretations of specific vineyards and varieties than does any other place in the world, yielding a truly dizzying array of wines. Certainly, readers aren’t likely to come across another region with as many winemakers who all seem to share a fixation with making as many different wines as possible from myriad plots of vines and different cultivars. Even apparently minimal changes in slope gradient or soil composition spark the inborn appreciation of terroir that Alsatians harbor in spades, and thus many wineries offer multiple bottlings of Riesling, Pinot Gris and Gewürztraminer, not to mention a number of sparkling wines (called Crémants, made by secondary fermentation in the bottle in the manner of Champagne) and sweet late-harvest examples ('Vendanges Tardives' or 'Séléctions de Grains Nobles'). 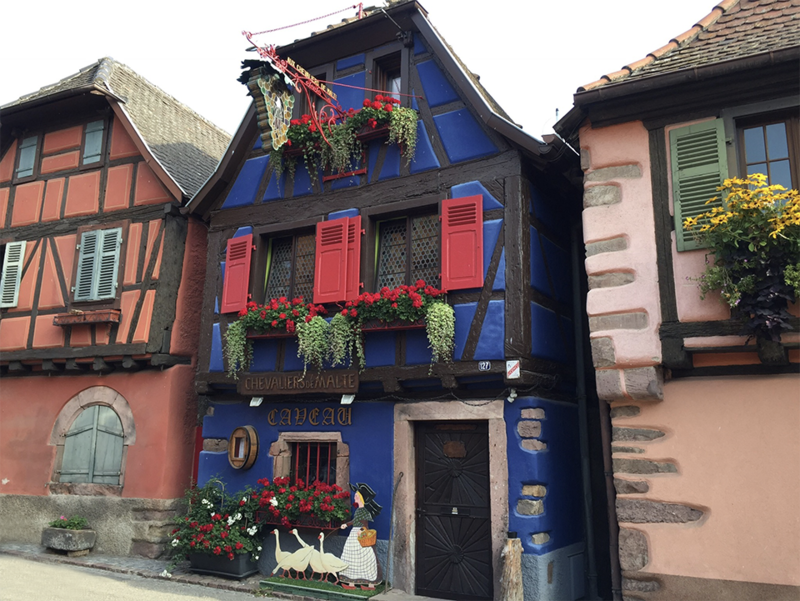 It follows that every new Alsace vintage offers wine lovers a panoply of mesmerizingly different wines that speak of the grape varieties from which they are made and the land they are from, not to mention the people who make them. The dry wines for which Alsace is best known are made from a number of grapes, the most important of which are Riesling, Pinot Gris, Gewürztraminer, Muscat (most often blends of two different Muscat varieties: Muscat Ottonel for its perfume and Muscat d’Alsace – the Moscato Bianco of Italy – for backbone) and Pinot Noir. Over the last two decades Alsatian Pinot Noirs have improved dramatically, and thanks to a combination of climate change and producer perseverance, many of these wines are downright exciting today – in some cases remarkably Burgundian – but much less expensive. Another wine of note in Alsace is Pinot Blanc, which is most often a blend of two grapes, true Pinot Blanc and Auxerrois, with the latter almost always making up the lion’s share of the blend. This can lead to the awkward situation of Alsatian wines that are labeled Pinot Blanc but in fact are made wholly from Auxerrois. Alsace Sylvaner is a delightful and much underrated wine. While they have long been out of fashion, these bright, delicious, crisp wines can match perfectly with many vegetable and fish dishes. Most importantly, Sylvaner has the advantage of reaching physiological maturity at reasonable levels of grape sugar. So, these wines typically clock in at a modest 12% alcohol, while Riesling and Gewürztraminer grapes generally need to reach 14% potential alcohol before they reach physiological ripeness. Over the last 20 years, sales of Alsatian wines have slumped in some export markets (the U.S., for example) but the producers I spoke with during my latest visit to the region last August and September maintained that, for the most part, sales were fine, thanks to the internet and to consumer purchases direct from the wineries. But one issue that has hurt Alsatian wine in the past is that some of its supposedly dry wines do not taste classically dry at all. This situation is largely due to habit and tradition. Many Alsatians really think of a wine with ten grams per liter of residual sugar as dry, when in fact it won’t taste dry to most people. But a wine’s relative dryness or sweetness depends very much on its level of acidity, so wines that are higher in acid can carry more residual sugar and still taste dry. In an effort to communicate to wine lovers just how perceptibly sweet or dry their wines are likely to taste, many of Alsace’s producers have taken to providing a dryness/sweetness scale on their back labels. Unfortunately, numerous different scales have been created and adopted by different producers (some originally chose to use a four-point scale, some a five-point scale, and still others a ten-point scale), but in general the lowest numbers mean the wine is dry and the higher numbers mean the wine tastes sweet. However, the European Union only recognizes the 1 to 4 scale, according to which 1 is sec, or dry; 2 is demi-sec, or off-dry; three is moelleux, or fairly sweet; and 4 is doux, or downright sweet. Not surprisingly, this is the scale you’re most likely to encounter on back labels nowadays. In fact, a number of Alsatian estates have recently been hit with fines for continuing to use five- or ten-point scales on their label. Alsace was probably the luckiest French wine region in 2016, as it escaped the double whammy of hail and frost that plagued so many other parts of France (Chablis, for example). Still, it wasn’t all smooth sailing. When I visited Domaine Zind-Humbrecht and asked about the vintage, Olivier Humbrecht joked: “It was both the rainiest and the driest year in memory.” In fact, the 2016 growing season was preceded by a mild winter, and the spring then brought copious rainfall: 300 to as much as 500 millimeters of rain had fallen in various parts of the zone by the end of May – rare for Alsace, which is one of the driest parts of France. So the flowering was delayed, and took place about three weeks behind schedule. But by then the temperatures were generally warm and the rains had stopped so the flowering went well, and potential production was not reduced. Beginning in mid-July, the weather turned very hot and dry, with practically no rain falling until the late autumn, by which time most of the grapes had been picked. Interestingly, the growth cycle never caught up in 2016 and thus the harvest took place at a leisurely pace during a relatively cool, dry autumn. To cite just a few examples: at Domaine Albert Mann the harvest usually lasts five weeks, but in 2016 it took nine weeks; at the Rieflé-Landmann estate, the grapes are normally picked over 21 days but in 2016 the harvest lasted five weeks; and at Zind-Humbrecht, the harvest took three weeks in 2015 but six weeks in 2016. The year’s weather brought both positives and negatives. For example, the early-season humidity triggered some problems with mildew. Thanks to the long hang time and dry summer and fall weather, some producers were able to make late-harvest wines (mostly VTs, as SGNs were harder to come by because the rains began falling again before much noble rot arrived). In 2016, some producers also managed to make a vin de glace, or ice wine, a rarity in Alsace. In contrast to the richer, rounder 2015s, wines from a very warm, dry vintage, the wines of 2016 are mostly graceful and refined, as the grapes were picked at mostly moderate sugar levels, which translated into lower alcohol levels than usual. Overall, the Pinot varieties performed best in 2016, and Pinot Gris is probably the most successful grape of the vintage. There are many dense, deep but elegant beauties to choose from. But the cool fall weather in ’16 meant that Riesling had a harder time reaching full ripeness in many vineyards. The 2016 Muscat, Sylvaner and Pinot Blanc wines are very successful (especially the latter two), displaying bright, crisp, clean aromas and flavors, and, while the 2016 Gewürztraminers are less opulent and showy than the outstanding examples of 2015, they are perfumed and nicely balanced. For a description of the 2015 growing season, please see my article “Alsace: The 2015s and Late-Released 2014s,” which was published in March of 2017. The wines in this report were tasted during my annual winery visits in Alsace during August and September of 2017 and subsequently in my office in Rome in February and March of this year.